Bristol City moved above fellow Championship strugglers Huddersfield Town thanks to two first-half goals. City went ahead when Jonathan Kodjia headed home Marlon Pack's free-kick. Huddersfield's Emyr Huws saw a penalty saved by Frank Fielding before Aden Flint headed the second from Luke Freeman's set-piece. Harry Bunn thundered home from long range to give Town hope with four minutes to go, but Kyle Dempsey was denied a late equaliser by Fielding. Town have now lost their past four home matches and three of their four games under new head coach David Wagner. They were undone by two training-ground routines from Steve Cotterill's side as first Kodjia and then Flint were left with simple chances. In between the goals Huddersfield should have levelled after Nahki Wells was fouled in the area by Luke Ayling, but Fielding kept out Huws's effort from the spot. The Terriers dominated after the break with Joe Lolley and Dempsey both going close before Bunn scored from almost 30 yards out. 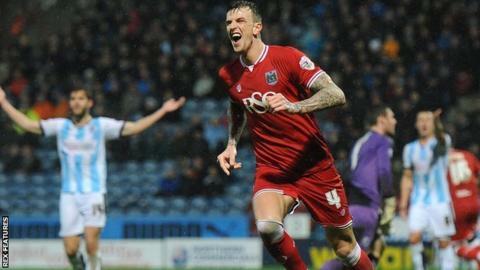 Fielding denied Dempsey at the death as Bristol City claimed just a second away win of the season. "Parts of the game were not good and the result was disappointing. "We lost because of ourselves and not because the opponent was stronger than us. "We did not defend the set pieces well enough and we did not take our chances. We need to be more clinical. "Maybe there were too many passes but we created two excellent chances but didn't score them and we missed a penalty and if you do that it is difficult to win." "We knew this was going to be a tough game with not much in it and this was a huge win for us. "We work hard on our free-kicks in training because they can make all the difference in tight matches. "It's bordering on an obsession for me in training but set plays are worth their weight in gold." Match ends, Huddersfield Town 1, Bristol City 2. Second Half ends, Huddersfield Town 1, Bristol City 2. Offside, Bristol City. Kieran Agard tries a through ball, but Mark Little is caught offside. Attempt blocked. Elliott Bennett (Bristol City) left footed shot from the right side of the box is blocked. Assisted by Mark Little. Joe Bryan (Bristol City) is shown the yellow card. Substitution, Bristol City. Mark Little replaces Luke Freeman. Attempt saved. Kyle Dempsey (Huddersfield Town) left footed shot from the centre of the box is saved in the centre of the goal. Foul by Simon Cox (Bristol City). Ben Chilwell (Huddersfield Town) wins a free kick on the left wing. Goal! Huddersfield Town 1, Bristol City 2. Harry Bunn (Huddersfield Town) right footed shot from outside the box to the top left corner. Assisted by Joe Lolley. Kieran Agard (Bristol City) is shown the yellow card. Attempt missed. Tommy Smith (Huddersfield Town) right footed shot from outside the box misses to the left. Attempt missed. Kyle Dempsey (Huddersfield Town) right footed shot from the right side of the box is close, but misses to the right. Assisted by Harry Bunn. Corner, Huddersfield Town. Conceded by Joe Bryan. Substitution, Bristol City. Simon Cox replaces Jonathan Kodjia. Attempt blocked. Liam Moore (Bristol City) left footed shot from the left side of the box is blocked. Assisted by Aden Flint with a headed pass. Corner, Bristol City. Conceded by Harry Bunn. Attempt missed. Luke Freeman (Bristol City) left footed shot from outside the box is too high. Joe Lolley (Huddersfield Town) hits the left post with a right footed shot from outside the box. Assisted by Harry Bunn. Kyle Dempsey (Huddersfield Town) is shown the yellow card for a bad foul. Substitution, Huddersfield Town. Harry Bunn replaces Nahki Wells because of an injury. Attempt missed. Sean Scannell (Huddersfield Town) right footed shot from the right side of the box is too high. Attempt saved. Nahki Wells (Huddersfield Town) right footed shot from outside the box is saved in the top right corner. Assisted by Tommy Smith. Attempt blocked. Ishmael Miller (Huddersfield Town) left footed shot from the centre of the box is blocked. Assisted by Joe Lolley. Attempt blocked. Ben Chilwell (Huddersfield Town) right footed shot from outside the box is blocked. Assisted by Joe Lolley. Attempt blocked. Ishmael Miller (Huddersfield Town) left footed shot from outside the box is blocked. Assisted by Tommy Smith.